Last night I finished "The Testament" by John Grisham. Interesting book. It opens with a first person, present tense, account that is intimate and shocking. The story is told by a ridiculously wealthy man, Mr. Phelan, who is at the end of his life. His one overriding goal is that his heirs not get hold of his millions. No, scratch that. Billions. "Down to the last day, even the last hour now. I'm an old man, lonely and unloved, sick and hurting and tired of living. I am ready for the hereafter; it has to be better than this." The first person account lasts for the first two chapters, after that Grisham shifts to third person past tense. He couldn't have continued to tell the story in first person perspective because (spoiler alert) Mr. Phelan--the POV character--commits suicide. "[...] I rise from my wheelchair. My legs are shaking. My heart is pounding. Just seconds now. Surely I'll be dead before I land. “Hey!” someone shouts, Snead I think. But I'm moving away from them." Still, it's unusual, shifting both tense and POV two chapters into a book, but I think it worked. I don't see how the story could have been told more effectively another way. The storyteller needed to build up some sort of reader identification for Mr. Phelan and I think that was the best way of doing it. Also, it was interesting. How many times do billionaires about to commit suicide talk to us frankly, truthfully, about their lives, their loves, their regrets? I think the odd shift in POV and tense was done because all through the book Mr. Phelan's negative points, his many failures as a father, his philandering, his cruelty, are the focus of discussion. But for the purposes of the story, it's important that we, the reader, want the billionaire's last wishes honored even though he was a less than stellar human being. If we don't care about that, we won't care about the story. Did the shift in POV work? What do you think? Regardless of whether you've read "The Testament," what do you think about switching from first person to third person, or vice versa? If you read "The Testament," do you think it worked? Was it effective? Necessary? Or would it have been better to have maintained a uniform POV throughout? 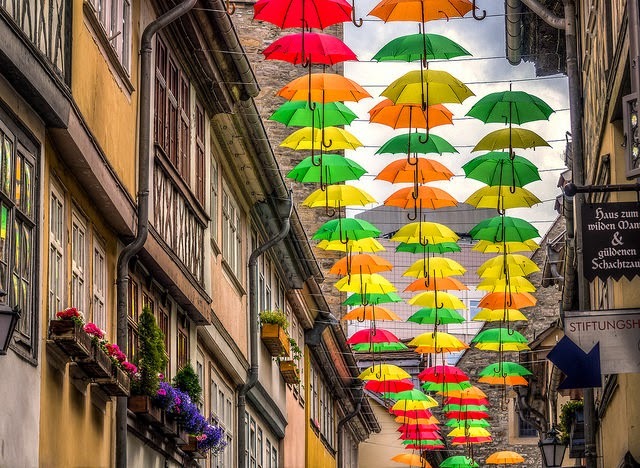 Photo credit: "Umbrella Street" by *Light Painting* under Creative Commons Attribution 2.0.